Humble Bundle and IDW Publishing have teamed up to launch their biggest comics bundle together to date in the “Humble Comics Bundle: Transformers vs. G.I. Joe presented by IDW” bundle. This digital promotion is being offered in support of the Hasbro Children’s Fund. The digital bundles of comics included volumes from The IDW Collection including all of IDW’s Transformers and G.I.Joe comics in chronological order, making them perfect for new or returning readers. The bundle features the work of creators like James Roberts, John Barber, Mairghread Scott, Mike Costa, Christos Gage, Jae Lee, Andrew Griffith, Alex Milne, S.L. Gallant, Antonio Fuso, Sara Pitre-Durocher, Corin Howell, Livio Ramondelli, John Rieber, and more. As with all Humble Bundles, customers can choose how their purchase dollars are allocated, between the publisher and charity. The Humble Comics Bundle: Transformers vs. G.I. Joe presented by IDW supports the Hasbro Children’s Fund. You can visit https://www.humblebundle.com/books/transformers-vs-gi-joe-comics to find out more! 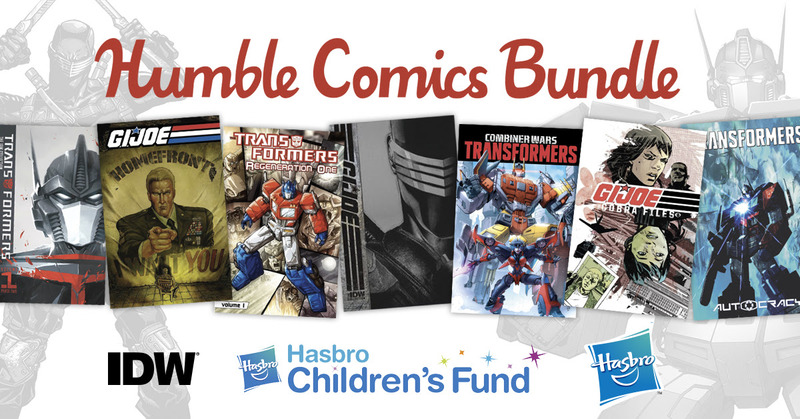 The Humble Comics Bundle: Transformers vs. G.I. Joe presented by IDW will run from August 16-August 30 at 11 a.m. Pacific time. Customers can pay $1 or more to receive: G.I. Joe (2013) Vol. 1: Homefront; G.I. Joe (2013) Vol. 2: Threat Matrix; G.I. Joe (2013) Vol. 3: Siren’s Song; G.I. Joe (2014), Vol. 1: The Fall of G.I. Joe Part 1; G.I. Joe (2014), Vol. 2: The Fall of G.I. Joe Part 2; G.I. Joe: Cobra Command Vol. 1; G.I. Joe: Cobra Command Vol. 2; G.I. Joe: Snake Eyes: Agent of Cobra; G.I. Joe: Snake Eyes/Storm Shadow, Vol. 1; G.I. Joe: The Cobra Files Vol. 1; G.I. Joe: The Cobra Files, Vol. 2; and Transformers: Regeneration One Vol. 1. Customers who pay $8 or more will also get: G.I. Joe: Cobra – The Last Laugh; G.I. Joe: The Cobra Files Vol. 1; G.I. Joe: The Cobra Files, Vol. 2; Transformers: Combiner Wars; Transformers: Evolutions – Hearts of Steel; Transformers: Nefarious; Transformers: Regeneration One Vol. 2; Transformers: Regeneration One Vol. 3; Transformers: Regeneration One Vol. 4; and Transformers: Till All Are One, Vol. 1. Customers can pay $15 or more for all of that plus: G.I. JOE: The IDW Collection, Vol. 1; The Transformers: The IDW Collection, Vol. 1; Transformers vs. G.I. Joe: Tyrants Rise, Heroes are Born; Transformers: Autocracy Trilogy; Transformers: Salvation; Transformers: Till All Are One, Vol. 2; Transformers: Windblade – Dawn of The Autobots; and Transformers: Windblade – Distant Stars. Customers who pay $20 or more will receive the content from the first three tiers as well as: G.I. JOE: The IDW Collection, Vol. 2; G.I. JOE: The IDW Collection, Vol. 3; The Transformers: The IDW Collection, Vol. 2; The Transformers: The IDW Collection, Vol. 3; The Transformers: The IDW Collection, Vol. 4; Transformers: IDW Collection Phase Two, Vol. 1. Customers who pay $25 or more will receive all of the above, plus: G.I. JOE: The IDW Collection, Vol. 4; G.I. JOE: The IDW Collection, Vol. 5; G.I. JOE: The IDW Collection, Vol. 6; G.I. JOE: The IDW Collection, Vol. 7; The Transformers: The IDW Collection, Vol. 5; The Transformers: The IDW Collection, Vol. 6; The Transformers: The IDW Collection, Vol. 7; The Transformers: The IDW Collection, Vol. 8; Transformers: IDW Collection Phase Two, Vol. 2; Transformers: IDW Collection Phase Two, Vol. 3; and Transformers: IDW Collection Phase Two, Vol. 4.